1) Soak the hominy and beans in a large bowl with water overnight. 2) The next day, in a large sauce pan, heat six cups of water. Add the two tablespoons of olive oil, onion, garlic and bay leaf to the pan. 3) Bring it to a boil and add the hominy and beans. 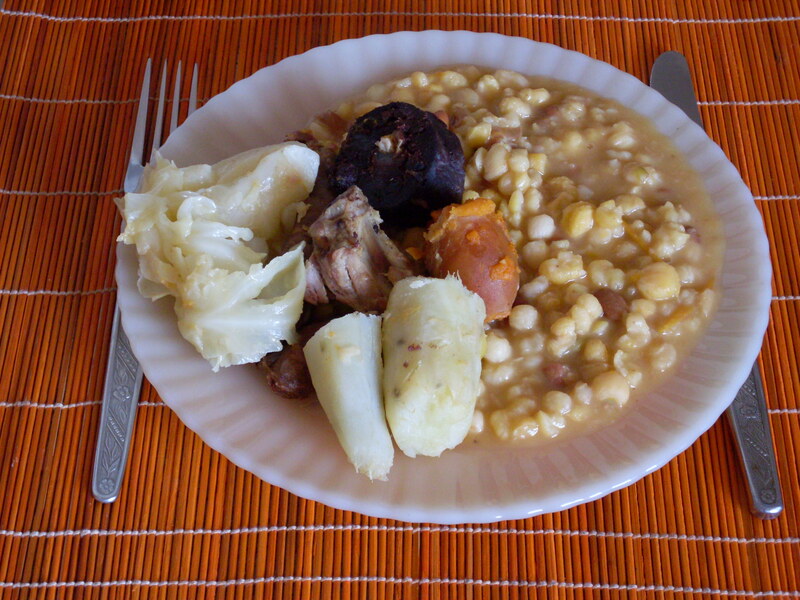 4) In a separate large saucepan, cook all the vegetables together with the chourico, blood sausage, and bacon. 5) Once done, let it simmer until the hominy and beans are almost tender. 6) Add the cooked vegetables and meats into the large saucepan on top of the hominy and beans. Cook on low heat for approximately one hour. 7) Turn off heat and let sit in the covered pot for at least one half hour. 8) Place on a large platter, cover with the coriander, and serve.